Touchscreens have altered the way we view and interact with technology. Current systems confine the touch interface to the device it is shipped with, most often smartphones, tablets, and the latest wave of laptops. But a newly launched product by startup Ubi, however, converts any surface into a touchscreen. 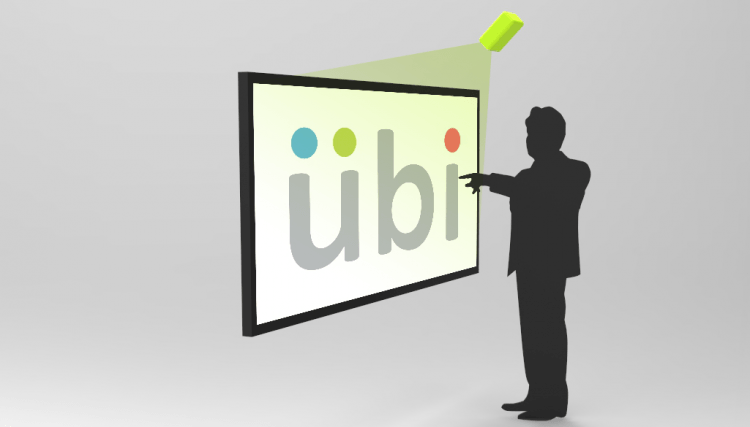 If you’re already armed with a Microsoft Kinect for Windows sensor and a projector, then all you have to do is purchase the accompanying Ubi software. According to the company website, the software retails between $149 and $1,499, which varies by the display size and the level of customer support offered. Ideally, the system should be setup by shining images onto one side of a transparent surface (so the projection isn't hindered by your hands or body), and placing the Kinect sensor on the other side. The Kinect sensor accurately tracks all user movements, providing the same basic functionality as what we have come to expect with smartphones and tablets. This means that opening and closing programs with a single touch, scrolling through items with a flick, or expanding areas with pinch-to-zoom, are all gestures understood by the program. It’s easy to see the untapped potential of such a technology. The Ubi system could revolutionize the way teachers conduct their classrooms, transforming a boring whiteboard into an interactive learning experience. Retail stores could also use the touchscreen software to display product information and promotions wherever they see fit. Furthermore, giant touchscreens could be used for business presentations in conference rooms. And perhaps the biggest advantage of this technology is that it eliminates the expensive screen hardware, dramatically reducing costs. For many, seeing is believing. So check out the demonstration video by Ubi below.